1. The earthly matter of which the body is formed. 2. A formative, vegetative force, which ties in with the fact that the first man and woman, Ask (Ash) and Embla (Oak) were formed from trees. Thus the earthly matter and vegetative force were united already in the course of nature when the three Gods, Oðin, Honer, and Loder, found them. 3. Loder gave lá, the force of the blood, as creating race and family types, but also as giving the animative force, which means the way a conscious being moves and acts. 4. Loder also gave litr, which is the form of the personality which can be projected outside the body, can appear to others, and is like an inner, or spirit-body in the image of the Goðanum, hence, another term for it is litr Goða. 5. Honer gave odr, the kernel of the human personality, the ego, with its memory, capacity for understanding, fancy, and will. 6. Oðin gave önd, spirit, such qualities as power of thought, courage, honesty, veracity, mercy, and the humility of patiently bearing such misfortune as cannot be averted by human ingenuity. These qualities are those through which a human participates in the divine in an inner sense, just as through litr goða, he or she has the outer form of the Gods and Goddesses. It is the litr, odr, and önd, which together are the personality which survives physical death. These litr and the lá depend on the enlivening air. Oðin, Himself, is, amongst other qualities, God of the Winds, and in some accounts, was said to breathe the önd into us. "This is one of the things humans here revoked when the "traitor circuit" was activated in them, making them traiterous to the Gods and all of life here including their own. It is our pleasure to share it once again with you. Humans who are traitors to themselves as well as all of creation seek to limit the world's systems of sacred observation to "selection" from among a few world dominating Monotheisms. Thusly, the sacred legacy of many human species also have vanished. Currently, NWO monies for "Diversity Training" are used to advance special privileges on tropical-origin peoples and to transfer to them the material legacy of European Man - order, discipline, promptness, workmanship, and the fruit of these cultural traits - plenty. This is part of their population replacement program. 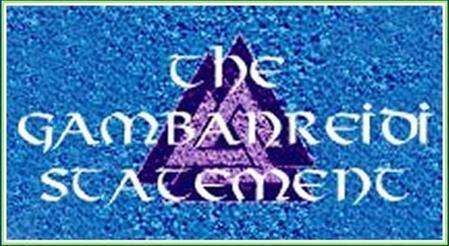 The Gambanreiði Statement Site is dedicated to the heroes of our Folk. Over many dark centuries the Vitkar have worked in the shadows to keep alive our knowledge in the face of theocracies and state terror. 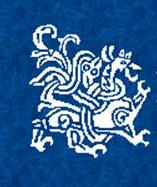 The Gambanreiði Statement, printed since 1979, is offered here as an on-line journal.